The 60 second mark for 100m freestyle stands as a significant milestone in the development of any swimmer. It has a certain resonance with swimmers, much as the 4 minute mile does for athletes, albeit perhaps now slightly easier to achieve for the swimming population at large. In the years since Johnny Wiessmuller broke the 60 second mark for the first time ever in 1922 clocking 58.6, and Dawn Fraser became the first woman to do likewise clocking 58.9 in 1962, the barrier which once marked an athlete as truly world class has become a barrier now aimed at squarely by those of a more modest level of performance, but that doesn’t make it any less of a personal achievement for a swimmer to dip under the magic minute. indeed, it remains a significant stepping stone in a young swimmer’s progression, and remains a target that is chased by masters swimmers everywhere, whether seeking to regain past glories or tilting at the mark for the first time. But what is the best way to wriggle under 60 seconds? Some argue for a fast opening 50 and then hanging on for the second half of the race. Others advocate a more measured approach over the opening half with a stronger homeward section. A minority would even suggest even or negative splitting the race. In order to investigate these approaches, we have analysed a large number of swims from the last 10 years. Using results data from the National Masters championships swum at Sheffield each October for the period from 2000 to 2010, we’ve extracted every swim between 58 and 62 seconds. These have then been analysed against a number of criteria; masters gives a good basic set of data because fitness levels, technique and length of time in the sport all vary widely and can hence to some extent be discounted when considering the impact of pacing on the overall result. Where possible the corresponding 50m freestyle time was also obtained from the same meet so that the impact of overall speed can be assessed. So which fares better: a gung-ho approach from the gun or a more measured approach. The graph below plots opening 50m split against the finishing time. 100m time (horizontal axis) vs opening 50m split (vertical axis). Swimmers sub 60 shown in red, over 60 in blue. 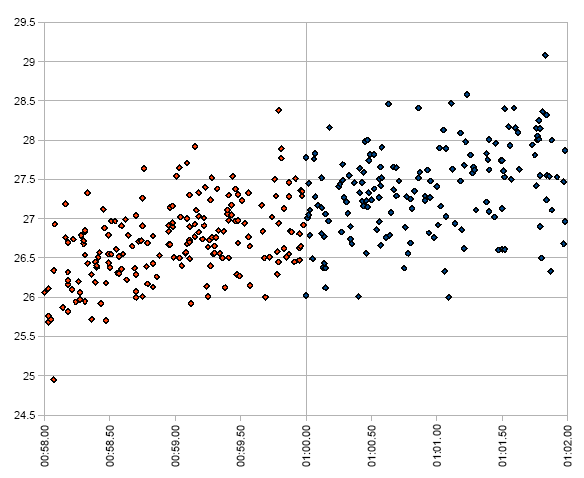 100m time (horizontal axis) vs opening 50m split (vertical axis) for the range 59.85 to 1:00.15. Swimmers sub 60 shown in red, over 60 in blue. Once you get to this range of times (or realistically are swimming under 1:00.50) either swimming faster at the start or getting fitter will get you over the line – which works will come down to the individual. Do people who are more circumspect over the first 50 bring it back faster? 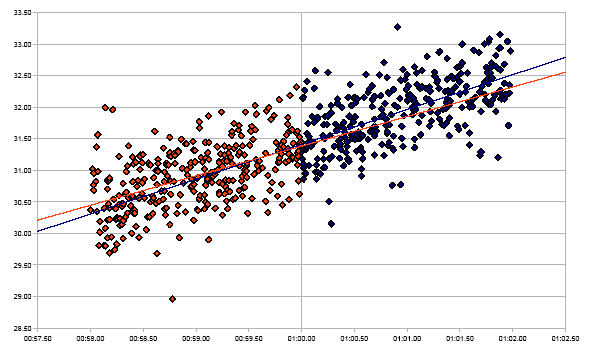 Again the graph below plots the second 50m split against the finishing time. 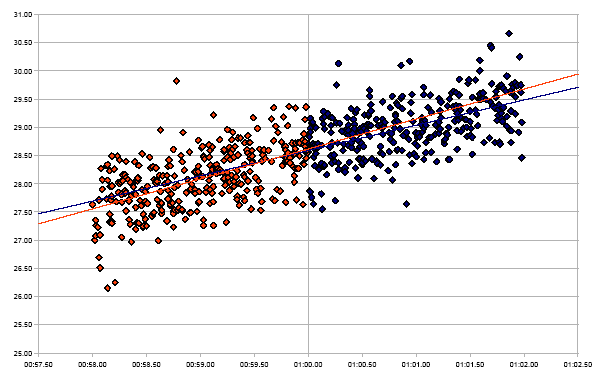 100m time (horizontal axis) vs second 50m split (vertical axis). Swimmers sub 60 shown in red, over 60 in blue. But this doesn’t tell the whole story, because you can still make it under a minute with a slow second 50 provide you have started fast enough. The graph below hence plots the first 50m split against the second 50m split. Opening 50m split (horizontal axis) vs Second 50m split (vertical axis). Swimmers sub 60 shown in red, over 60 in blue. There isn’t a distinct division between those under 60 and those over it – indeed there is a lot of overlap between the two sets of swimmers, but for a given outward 50 time, unsurprisingly those under 60 seconds come home faster than those who don’t. Generally those who didn’t make it under 60 seconds who swam the fastest outward 50’s could perhaps do with taking it easier on the first 50 and bringing it home more strongly. It also shows, that with the exception of one swimmer who even paced his race, no one who swam under a minute swam the opening 50 slower than 29.40. Conversely there were plenty of people who swam their opening 50 faster than this but couldn’t then bring it home. Is the ability just to swim fast related to the 100m outcome or is it more to do with conditioning? 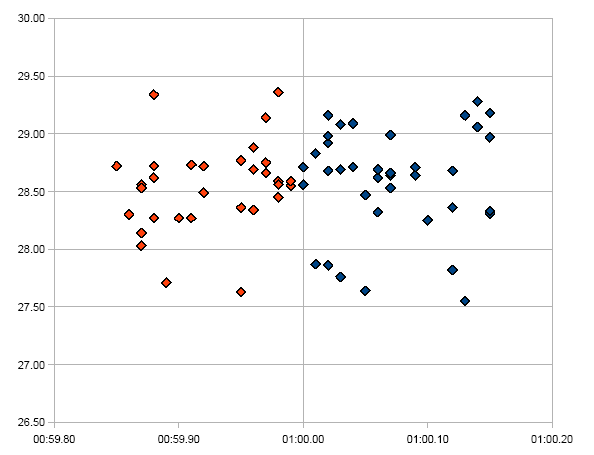 The graph below shows the 50m freestyle time plotted against the 100m time recorded by each swimmer at the same meet. 100m time (horizontal axis) vs 50m time (vertical axis). Swimmers sub 60 shown in red, over 60 in blue. This shows that in general there’s not much to choose in terms of raw speed between those over and under 60 seconds for the 100. Those under are generally slightly quicker, but the difference is small; the average 50m time for those with a sub 60 time was 26.72 whereas it was 27.38 for those over the minute. The implication being that everyone in the range considered has the speed to get under a minute, but perhaps need to work on their conditioning. You do need to have some basic speed – if you aren’t able to swim 50m in under 28.5 seconds you’re unlikely to crack 60 for the 100, so work on your speed. Once you’ve got that speed it’s a case of being able to hold on to it; the average drop off between first and second 50’s was 2.8 seconds for all swimmers, which means you need to be able to swim your second 50 in at least 31.4 to have a chance. 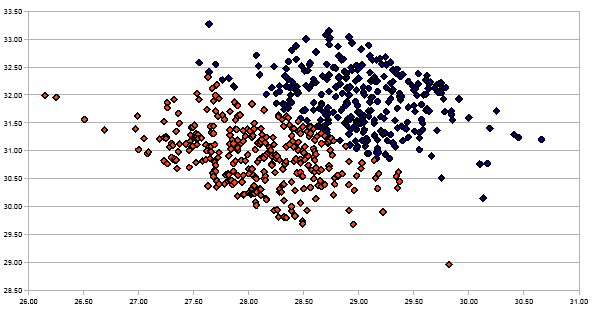 Generally speaking even or negative splitting is uncommon and is less likely to work – of the 627 swims considered only one was negatively split. You get an advantage form the dive so you may as well use it to get out fast and then work on your conditioning to reduce the amount you slow down over the second half of the race. For the average swimmer, the way to break 60 seconds from our analysis is to swim the first 50 in 28.59 and then the second in 31.40, giving an overall time of 59.99. However, as the graphs above show, any number of combinations can be successful -it all comes down to finding the perfect combination of speed and endurance for the individual.